Note: If the users are currently set as inactive, when you reset the password PureCloud automatically changes their status to active. 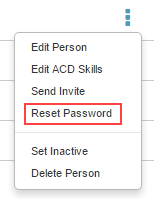 Click the More Options button and from the menu that appears, click Reset Password. Type a new password, and then confirm it. Note: To see the password as you type it, click Show. To obfuscate the password, click Hide. 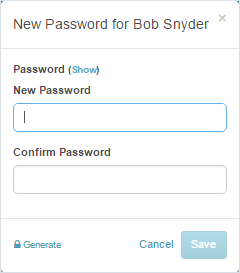 Click Generate to direct PureCloud to create a random password for you. Send the user the new password along with instructions to change it immediately using these instructions: Change your password.